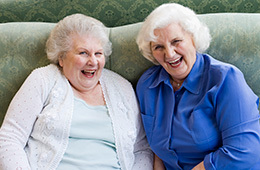 At The Cloisters we believe events and activities enrich our resident’s lives. We create a fun, uplifting environment where our residents can be social, get involved, and enjoy their favorite hobbies and activities. Our community serves our residents based on his or her unique needs. Our full-time staff is available to assist residents with activities of daily living so each one can focus in on the important items they would like to do each day. We provide our residents the opportunity to be able to enjoy the retirement life they have been looking forward to while enjoying our featured amenities. Extended congregate care is designed so residents can remain in familiar surroundings when they require a higher level of care and expanded scope of services than is permitted within standard assisted living communities. At The Cloisters we want you to be able to age in place. At The Cloisters, we provide our residents, no matter what level of care you are in, the opportunity to enjoy our community activities, amenities, events, and group gatherings. We believe that providing a lively lifestyle can bring you enjoyable daily choices to choose from. The Cloisters is part of Retirement Housing Foundation, a national, non-profit organization.